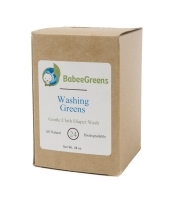 Our all natural, bio-degradable detergent has been specifically created for diaper laundering. Essential oils of tea tree and lavender allow for an anti-bacterial wash. Our gentle formula is pure and non-irritating to baby's skin. Working in two ways, Washing Greens acts as a deodorizer. By adding a scoop to the bottom of a diaper pail it neutralizes odors. For washing, simply toss entire load, detergent already included, right into the washer. Washing Greens comes with a pre-measured stainless steel scoop.